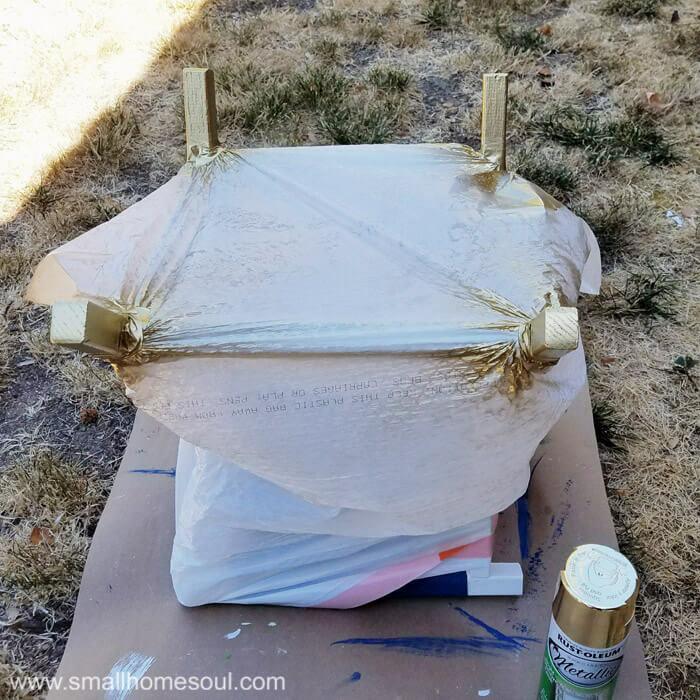 Canvas Folding Stool - Glam it up with Gold - Girl, Just DIY! 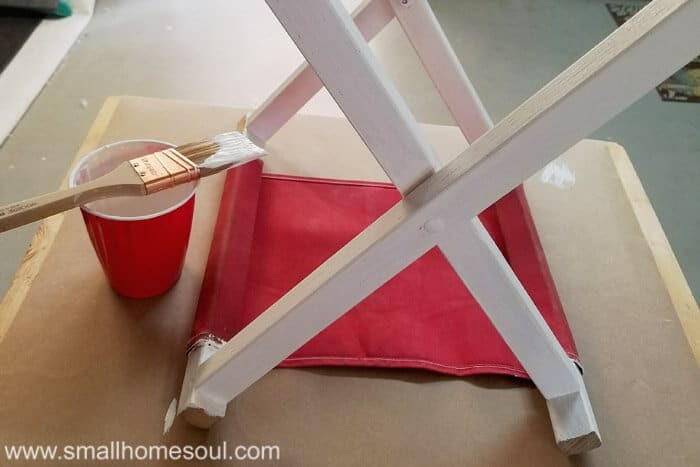 Don’t pass up the $5 canvas folding stool at yard sale or thrift store. They’re easy to update and useful as an extra seat in a pinch or as a quick footrest. They’re also a great size for kids. There wasn’t much that interested me that day but I spotted this little folding stool. I’m pretty sure it’s a vintage folding camping stool. I say vintage because I’m pretty sure the only kinds of chairs that make it camping these days are the folding chairs with arms. Yep, the ones you can now even get with built in foot rests. 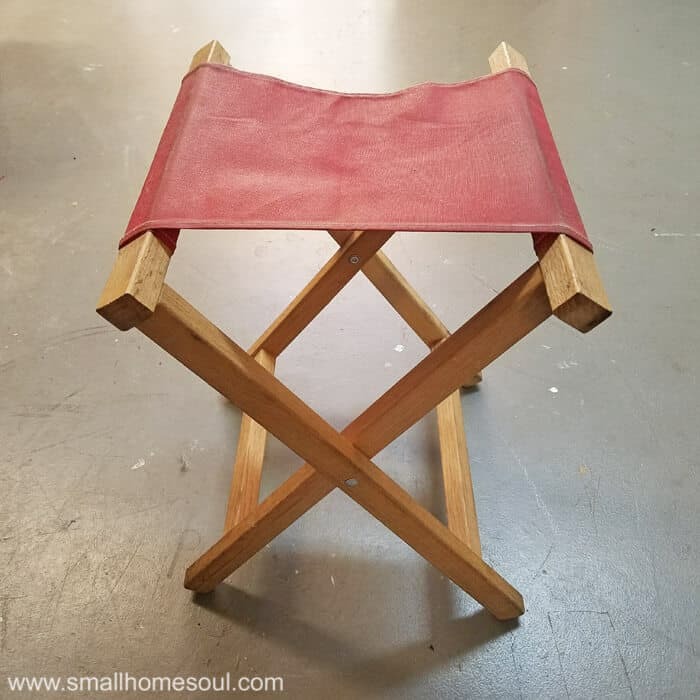 This little folding stool rode around in the back seat of my car until the other day when I finally got busy making it beautiful. I wasn’t in horrible shape. It was sturdy and just needed some love to make it look good again. I’ve never painted fabric before and I know a lot of people do it, so I’m excited to give this a try. After investigating how the canvas seat is attached I figured I’d start with paint first. I figure if I didn’t like how the canvas turned out painted I can always find a way to attach a new seat later. Mixing up some chalky type paint I got busy painting the body of the folding stool in white. I’ve painted a few things with chalky type paint but I’ve never purchased pre-mixed chalky paint. 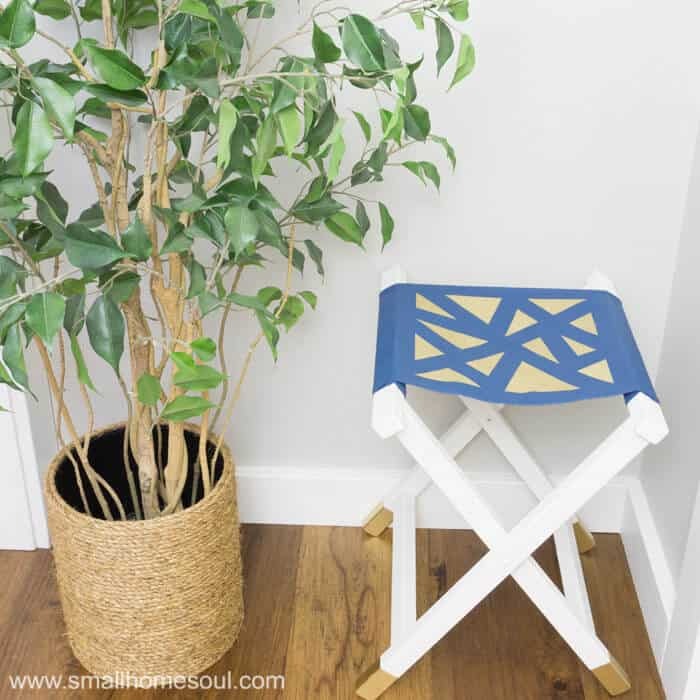 For the DIY chalky paint I made an Outdoor Plant Stand, and when I updated a Vintage Side Table, I used mix from Diva of DIY. 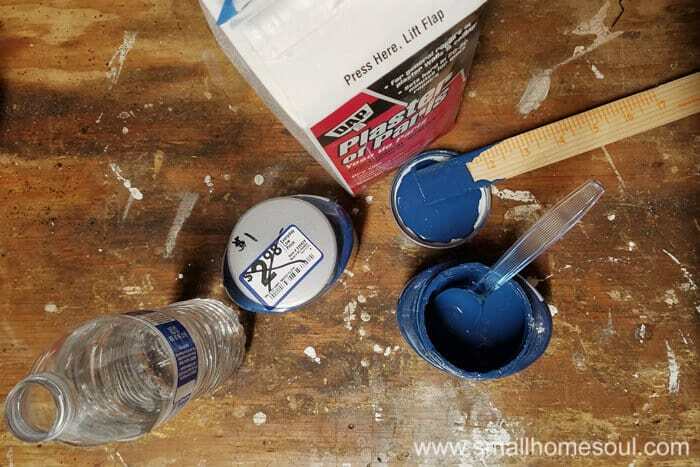 Chalky paint is really great when you want to get a project finished quickly. The paint dries quickly, has a durable finish, and most people don’t sand before they paint. But I sand, always. I do it to ensure the paint sticks, and to smooth out any nicks or imperfections in the surface. Paint has a way of highlighting imperfections. 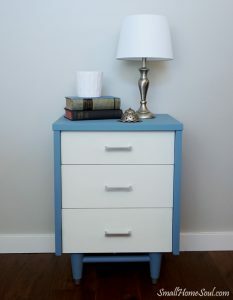 Since I don’t distress my furniture like most chalk paint users, I prefer not to see the imperfections. There are a few basic methods for making your own chalky paint. I used the Plaster of Paris and water method. Here’s the ratio and you can adjust up and down for your need. Mix 2 cups paint, 4 Tbsp Plaster of Paris, 2 Tbsp Water. For this table I mixed 1/2 c paint, 1 Tbsp PoP and 1.5 tsp water. It was really hot in my garage when I was painting the body so I had to keep adding a little water when the paint thickened up. At the end it was kind of like painting with pudding. But it still worked perfectly. When the temp is cooler the paint doesn’t tend to thicken. Depending on the wood type, you’ll need to apply a few coats of paint to get good coverage. Let it dry completely before moving to the next step. The next morning when it was dry and the garage cooler I used painter’s tape and taped off the frame areas around the seat. 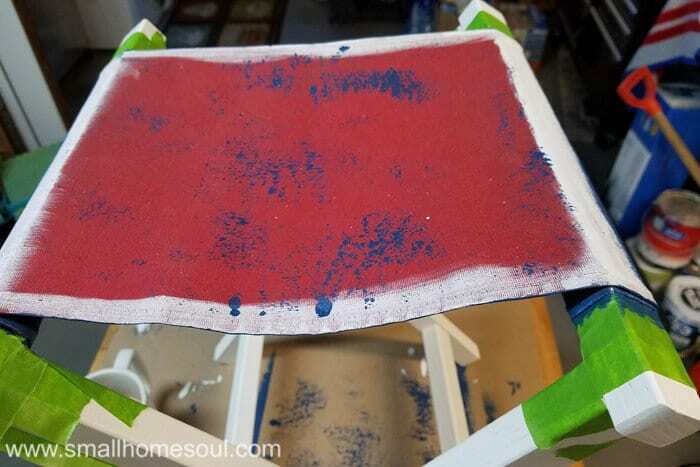 I had some samples of paint in Indigo Cloth I’d picked up at Lowe’s (for $1 clearance, score) and I had just enough left to paint the seat of the folding stool. Since I only had about 1/3 c. paint I adjusted the ratio of PoP and Water way down. Then I added a tiny bit more water; thankfully, it’s very forgiving. First I painted the underside of the seat and worked the brush into the area where the canvas was rolled around the cross pieces and all across the underside of the seat. The bottom will be visible when the folding stool is closed and I wanted a finished look. Here you can see where I really worked the paint into the fabric. You can always use a spray bottle and wet the paint a bit to really soak it in if needed. When the seat was completely dry it was time to glam things up a bit. I decided to do gold-dipped legs. Determine the amount of leg you want to be “dipped” in paint. Use painters tape to protect the area above the line. 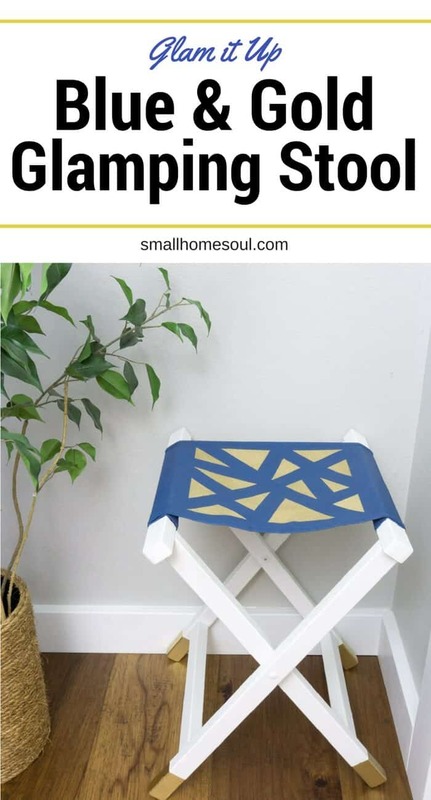 If you are using spray paint, as I did, you’ll need to protect the rest of the stool. Use a kitchen garbage bag. Make a whole for each leg and stretch the whole over the leg. Tape the bag just below the “dipped” tape line. After the legs were painted and dried my little folding stool needed a little something else to really finish it off. Tape off the edges and make random triangles with more tape. Use another kitchen garbage bag to wrap and protect the rest of the stool. Spray from above several light coats of gold paint. 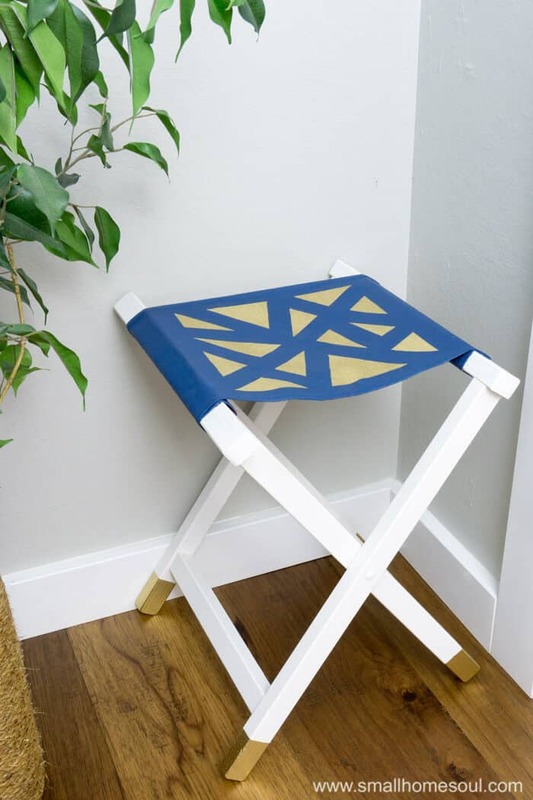 I couldn’t believe how great the little gold triangles turned this from a Camping Folding Stool into a Glamping Folding Stool. 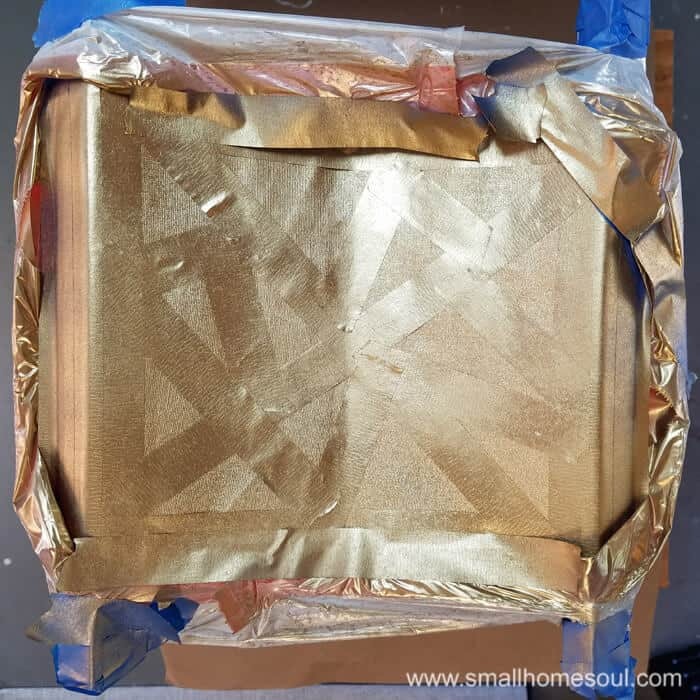 There were a few areas where the gold paint made it under the tape. I fixed those areas with a little blue paint and it looked perfect. If you haven’t already please sign up for my newsletter so you can stay up to date on all my projects. Join us the last day of each month for a different Inspired Makers Challenge. Follow with #InspiredMakers and #InspiredMakersChallenge to see more amazing projects each month! Super cute idea! I love the gold touches on the feet! You are super clever, Toni! How cute is this!! Love the colours you chose and those sweet little gold dipped legs!! You will be the envy of all campers!! Your new version looks so nice and I love how you used a trash bag and spray paint to make the gold feet! Thank you Natasha, I couldn’t imagine trying to rap that stool with paper and keep the paint out. I’m glad I thought of the garbage bag because it worked perfectly. Loving the geometric pattern, great job Toni! 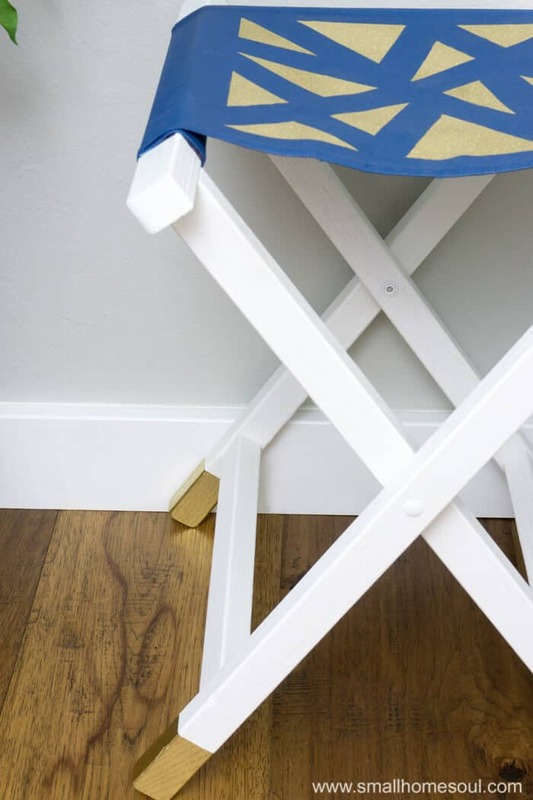 The little flash of metallic gold modernizes this little stool by 30 years. It looks great again. 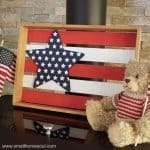 It can be used in so many places, like beside the couch for the daytimer, pencils, notepad etc. Very nice makeover. 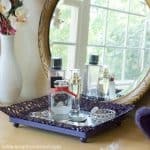 Thanks Leanna, I thought it could be a great little side table or even a plant stand with a big slice of wood on perched on top. So many uses, and yes, it is definitely out of the 20th century now. 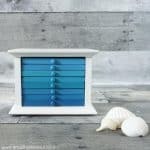 Way to think outside the box- now you’ve got a cute accent piece that you love!! Way to go!!? Thanks friend, it’s so much cuter now then when I found it. 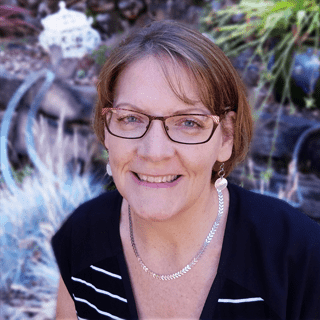 Thanks Angie, I’m glad I started on something small. If I were to do anything bigger I would definitely go slower and do the whole sanding process between layers to ensure more flexibility. The seat on the stool turned out perfect, and it folds up nicely and isn’t stiff. On a larger piece like a cushion I’d probably start on something I didn’t care how it turned out so I could perfect the craft. I have a chair I’d love to paint but I haven’t worked up the nerve yet. You gave that stool a much needed face lift! I need to get a couple of those at the thrift store. They really make good extra seating and they’re easy to store! Great transformation I love the gold tips on the legs. Toni, those gold tipped legged really glammed that baby up! What a great project…an perfect for extra seating anywhere! Thanks Sue, I’m really loving the gold! I love how this stool turned out! 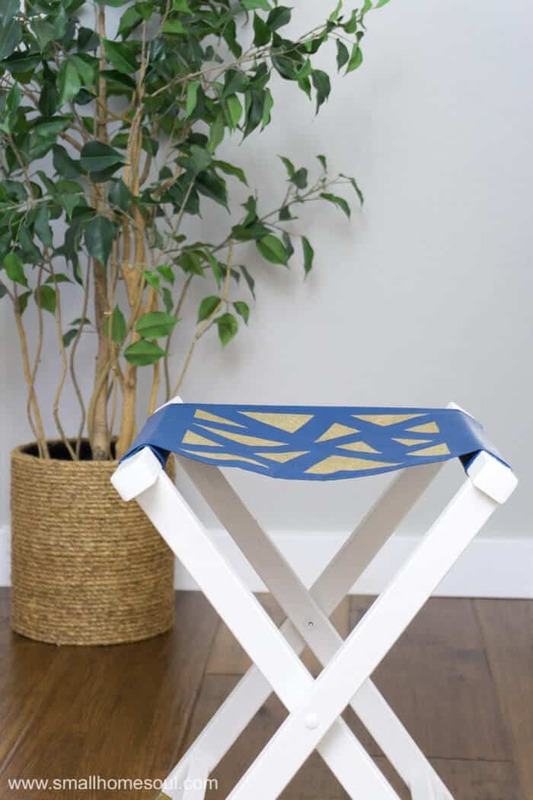 Your vision of this stool is amazing! I love the navy blue and gold combination!! Thanks Anika, and thanks for encouraging me to go for the gold 😀 I love it! So cute! I might even go camping if I could sit on a stool like that! 🙂 LOVE the gold. Thanks Susie, it turned out better than I imagined it would. It really is a cute little stool.